<img src="/sites/datacenterknowledge.com/files/wp-content/uploads/2009/12/nebula-container.jpg" width="470" height="287" /> What do you get when you combine cloud computing and data center containers? You get NASA's Nebula, the space agency's new data powerhouse, which provides on-demand computing power for NASA researchers. 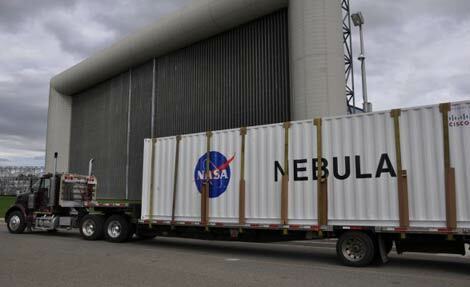 Nebula lives in a 40-foot container at the NASA Ames Research Center in Mountain View, Calif. The "data center in a box" was built inside a FOREST container from Verari Systems, which is filled with Cisco Systems' Unified Computing System and servers from Silicon Mechanics. The Verari data center container housing the NASA Nebula cloud computing application arrives at Ames Research Center in Mountain View, Calif.
What do you get when you combine cloud computing and data center containers? You get NASA's Nebula, the space agency's new data powerhouse, which provides on-demand computing power for NASA researchers. Nebula was recently cited by federal CIO Vivek Kundra as an example of the government's ability to "leverage the most innovative technologies." The Nebula application lives in a 40-foot container at the NASA Ames Research Center in Mountain View, Calif. The "data center in a box" was built inside a FOREST container from Verari Systems, which is filled with Cisco Systems' Unified Computing System and servers from Silicon Mechanics. Nebula is a self-service platform built from open source software that provides high capacity computing, storage, and network connectivity for NASA research. "Nebula has been designed to automatically increase the computing power and storage available to science- and data-oriented web applications as demand rises," explains Chris C. Kemp, Chief Information Officer of NASA Ames Research Center. "The containerized data center solution from Verari Systems and Cisco delivers the foundation for a next-generation cloud computing environment that is responsive to the needs of our developers so they can focus on mission success - without worrying about the capacity and availability of the computing infrastructure," said Kemp. "his solution is transforming how we think about NASA’s future computing environment." Data center containers allow for rapid expansion of IT infrastructure, and can provide excellent energy efficiency by offering more precise control of airflow within the container. Microsoft and Google have used containers as building blocks in large data centers, while some enterprises, universities and research ;abs have used containers to add incremental compute capacity. "Verari is simplifying data center deployment," says Dan Gatti, senior vice president of Worldwide Market Operations, Verari Systems. "Our customers are able to meet their computing and storage requirements much more quickly and easily than ever before. The planning cycle for a data center has been cut from two years down to 120 days, on average. And our customers are able to recognize huge cost savings in both OpEx and CapEx spend." Federal CIO Vivek Kundra tours the NASA Nebula data center container during a September visit to Ames Research Center.